There were 753 press releases posted in the last 24 hours and 153,523 in the last 365 days. Groundbreaking new two-part liquid pours into existing walls and hardens to become bulletproof – allows kids and staff to shelter in place until police arrive. 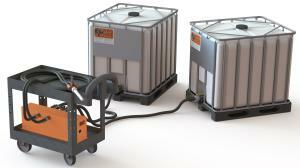 SAGLE, IDAHO, UNITED STATES, October 23, 2018 /EINPresswire.com/ -- Rhino Hide LLC today announced it will launch a line of liquid chemical wall-filler products that turn any classroom into a bulletproof safe-room where children and teachers can instantly shelter in place while waiting for the police to arrive. The projectile-resistant product can also be used to fortify community buildings against storms such as hurricanes or tornadoes. Rhino Hide’s competitors install small, bulletproof rooms inside one corner of each classroom. Precious time is wasted moving kids from their seats into the barricades. With Rhino Hide the classrooms are the saferooms. Kids can just wait for the police to arrive, safely in their seats. Rhino Hide LLC is actively recruiting a national network of over 300 companies that will become certified installers all over the United States. This network will provide highly-trained, quality installation and customer service. 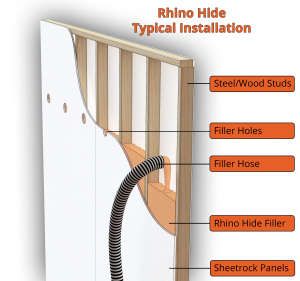 In addition to schools, Rhino Hide Bulletproof Wall Filler can be installed into community storm shelters, DIY home shelters, office and government buildings, police cars, military bases, movie theaters and even banks, protecting people wherever they gather from active shooters and severe storms. Rhino Hide is currently seeking a total investment of $107,000 in equity crowdfunding. Anyone can invest as little as $100 to own a part of the company at startengine.com/rhino-hide.